Lean and full of flavor, flank steak comes from the bottom of the cow’s abdomen. It’s filled with a lot of tough, lean, long-fibered muscles. Because of these tough muscles, flank steak benefits from marinating and long, slow cooking in the oven. A quick sear over high heat will Impart even more flavor into the final dish. In all cases, slice flank steak against the grain to increase tenderness. Because of the leanness and the long fibers, use a mix of oil and acid to tenderize the meat and to prevent it from drying out during cooking. Olive or canola oil can both be used, in a 1-to-2 or 2-to-1 ratio with an acid. The stronger the acid is, the less you need. For example, red or white wine can be used in a 1-to-2 ratio of oil to acid. For stronger flavors, such as white vinegar or lime juice, a 2-to-1 ratio of oil to acid is recommended. Add salt, pepper and dried or fresh herbs to taste. Because of the intense beefiness of flank steak, strong spices can be used, such as cumin, oregano, chili pepper or lemon rind. Marinate for a minimum of 2 hours, and up to overnight in the refrigerator. A longer marinade will lead to more tender meat and a deeper flavor. Searing your steak prior to cooking is recommended as browning adds extra flavor to the finished dish. Browning also helps preserve moisture, important for lean cuts such as flank steak. Heat a heavy bottomed pan over high heat, and coat with a thin layer of oil. Pat dry your steak, removing excess marinade. When the oil is smoking and shimmering, put the steak into the pan. Wait 2 to 3 minutes, then flip, allowing the steak to finish browning on the other side. While you can transfer your browned steak to a low-rimmed baking pan, or even use a sheet tray, an oven-safe pan that will work for both browning and baking is ideal. A seasoned cast-iron pan or a stainless steel frying pan works well going from the stove-top to the oven. Preheat the oven to 250 degrees Fahrenheit, setting a rack in the middle of the oven. Once the steak is finished searing, transfer the steak to either a baking tray, a sheet pan, or, if your frying pan is oven-proof, move the whole pan directly into the oven. Add in aromatics -- sliced onions, fresh herbs and chopped root vegetables -- to your pan to take advantage of the juices produced by the meat. There is no need to cover the pan while cooking, unlike with a slow cooker oven, but if you like, add a 1/2 cup of liquid -- such as water, wine or stock -- to the pan before placing it in the oven. Flank steak is best cooked rare, medium rare or so well-done that it is fork tender. Because of its leanness, medium or well-done steak can be tough and chewy. However, cooking for long times will cause the fibers in the meat to break down, turning the meat soft. For medium-rare steak, cook until the internal temperature reads 120 degrees Fahrenheit, then remove it from the oven and let the steak rest for 5 minutes before serving. It will take roughly 15 minutes in a 250 F oven for seared flank steak to reach medium rare. 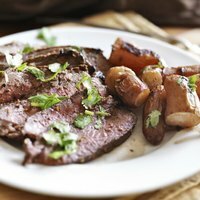 For fork-tender, fall-apart flank steak, slow cook for 1 to 2 hours, until the steak pulls apart easily with just a fork. For medium-rare or rare steak, slice thinly against the grain and serve alongside cooked vegetables. Fork-tender steak can be shredded prior to serving, and then served on top of roasted potatoes or steamed wild rice, with the cooking liquid spooned over the top.